I had been teaching conflict resolution to elementary school children in Washington DC for five years when I suddenly realized I was doing it all wrong. My peace classes were engaging and fun, my methods were inspired by some of the best curricula on conflict resolution, and many of the kids that I was teaching actually used the skills I had taught them. It all looked good. But day after day I would see children, often some of our most vulnerable and troubled students, being sent to the office for fighting at recess. Some of these kids would go straight from my classroom where we had been role-playing how to work out a conflict to the playground where they would get into a fight over who goes first on the swings. When I asked the kids why they didn’t use the conflict resolution skills, they usually looked at me blankly and shrugged their shoulders. Occasionally someone would say, “I was just too mad. I couldn’t think straight.” I was at a loss. But there was no explanation in step 1! How do you calm down? Telling someone who is angry, “Calm down,” doesn’t work. Telling someone who is angry to take a deep breath doesn’t work either. So what could I do? I was not a meditator back then. I had friends who were and I sort of knew what it was but I was one of those “My mind is too busy to meditate” people. I figured that I wouldn’t be able to do it and didn’t particularly want to. But the more I read about mindfulness the more I started to think that this was exactly the step that was missing from my conflict resolution lessons. So I spent a summer learning about mindfulness and starting my own practice. 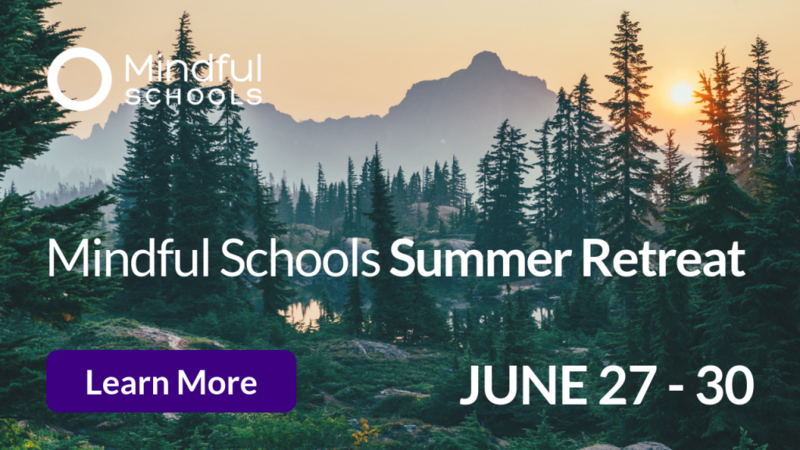 I read all the books and took the Mindful Schools Fundamentals course. I was terrified, but with three whole months of experience under my belt I dove in with my students in the fall semester. This was back in 2011 and mindfulness wasn’t quite the buzzword it is now. My colleagues thought I was crazy, and parents had a lot of questions. But the kids loved it. 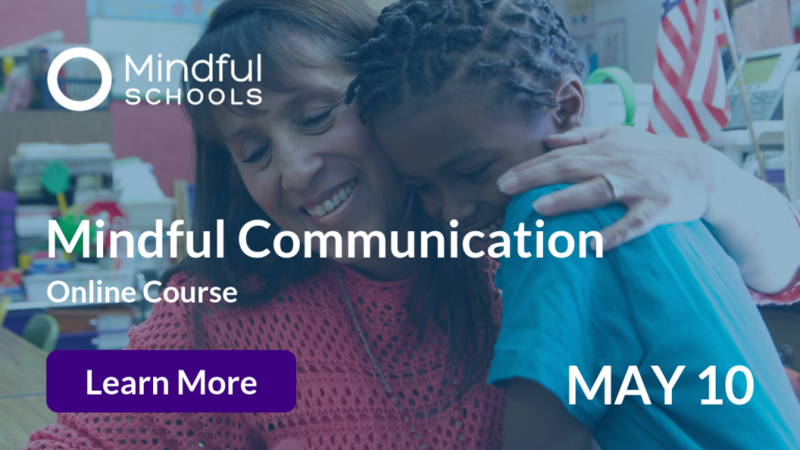 We began each of our weekly peace classes with mindfulness practice, and then we’d continue with our social emotional learning lessons about friendships, feelings, including people, listening, empathy, kindness and conflict resolution. After a few months the difference was noticeable. The kids (from first to fifth grade) not only loved the mindfulness practices, but the lessons we learned from mindfulness were deepening all of our other work. The result was most dramatic when we began our unit on Conflict Resolution. Now, instead of just focusing on how to work things out, we began to focus on how we got into the conflict in the first place. The kids began to feel the anger in their bodies when it was small. They learned how to use breathing to calm the anger. Before we had always talked about the “Conflict Escalator,” an idea I learned from the late William Kreidler’s book, Teaching Conflict Resolution through Children’s Literature. The Conflict Escalator is a way to think about how a conflict can go from being a small problem to a big conflict depending on how we respond to it. Now when we talked about the conflict escalator we could really see why our conflicts were escalating and we could use our breathing skills to help to de-escalate our conflicts. It was magical! We no longer needed to have a refocus room – a room where kids were sent at recess if they were in trouble – because so few kids were fighting at recess. I was amazed. Although things were so much better, I still felt like something was missing. 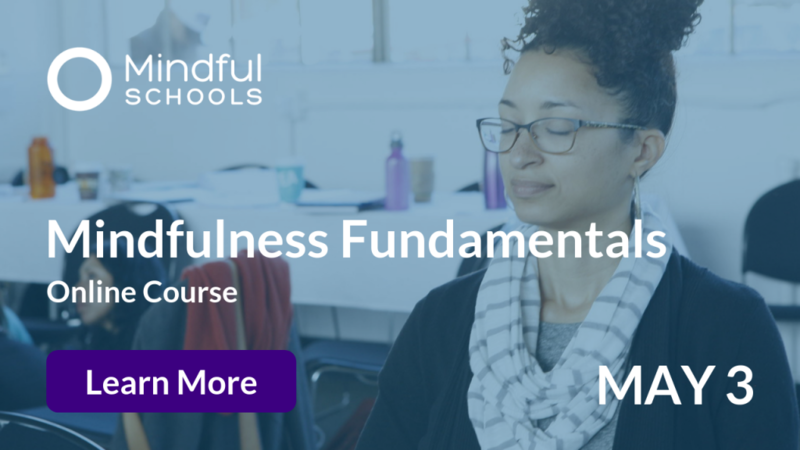 Even though I was grateful that mindfulness had helped my students recognize and regulate their anger I still didn’t understand what was really going on in the moment. Why weren’t they able to think when they were angry? Why did we all make such poor choices when we were mad? I don’t remember exactly when I heard about Dan Siegel but it was a moment that changed my life. I watched a video in which he shows how the amygdala (the part of the brain responsible for watching out for danger and reacting) takes over the brain when we get angry and how it in effect turns off the prefrontal cortex (the part of the brain responsible for thinking and executive function) and it blew my mind. I suddenly remembered those angry, red-faced students telling me that they didn’t use their conflict resolution skills when they were angry because they just couldn’t think. And now I knew why! They were right. They couldn’t think in that moment. Their amygdalas had hijacked their brains in order to protect them and had turned off all memory of my lessons. It all made sense now. 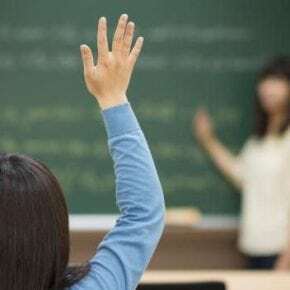 I went back to school the following year armed with what I now believe are the two most powerful conflict resolution tools: mindfulness and neuroscience. 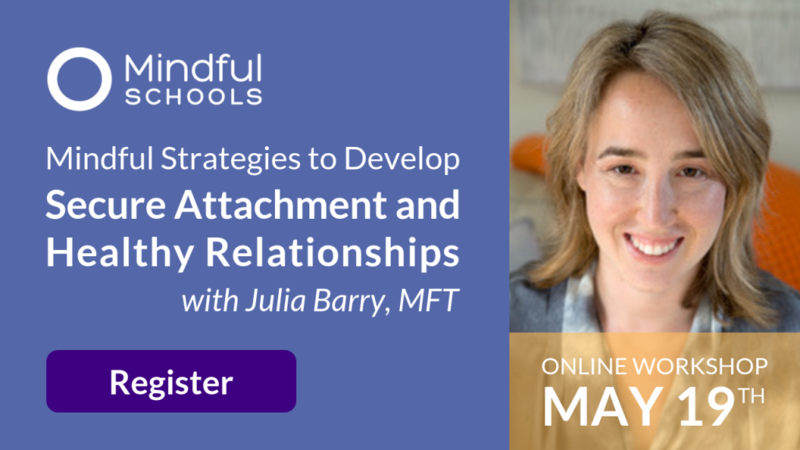 Once I was able to teach my students what was happening in their brains when they were angry and how they could take care of their brains with mindful breathing then working out the conflict was a breeze. This little bit of brain science has been incredibly liberating for my students, and for me! I was so excited about this information that I wrote a book about it. I looked everywhere for a fun storybook to help me teach my younger students about what happened in their brains when they were angry but surprisingly it hadn’t been written yet. So I wrote Rosie’s Brain, a story about a little girl who wants to play with her friend but has to go to her piano lesson instead. She gets angry and yells at her mom who sends her to her room to calm down. Up in her room she meets her amygdala (Amy), her hippocampus (Miss Pickles) and her prefrontal cortex (PFC). Together they explain to her what is happening in her brain and how she can use her mindfulness skills to help her calm down. I think my students love this book because it demystifies anger and helps them to see that it is a normal, biological process that we can have some control over. I’ve heard from many parents who also love the story because this information is just as liberating for adults. One day a new boy came into my classroom. He was a fifth grader who had just moved to DC. He was big and angry and really not happy with his new situation. Every time I saw him he looked miserable. Usually he would come into my classroom and sit in the back with his hood up over his face. One especially grim day he came in and lay face down on the rug, his head covered by his hood. I was at a loss so I slipped a copy of Rosie’s Brain under his hood. It sat there for a while but to my surprise after a while I realized that he was reading it. After class he came up to me and said, “Ms. Ryden, I don’t think I have a prefrontal cortex. I’m all amygdala.” He looked so sad. We had a great talk about about his brain and his feelings and I think he left feeling much better about himself. The next time he came to class he sat in the front and even smiled. Understanding your own brain and how to take care of it with mindfulness is transformational. I see it every day. I can say without a doubt that the lessons that my students are learning in peace class are changing their lives. I see it in action every day. 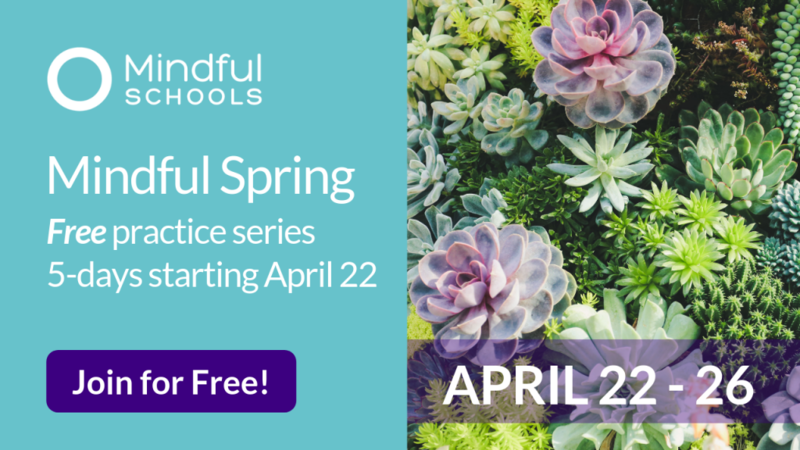 Kids tell me all the time how they were flipping their lids during a test or a baseball game or a conflict on the playground and how they were able to use their mindful breathing skills to help them to calm down. Imagine what our world could be like if all children were taught to understand their own brains, regulate their own emotions and work out conflicts peacefully. It has never been more important to prepare our children to create a more peaceful world. 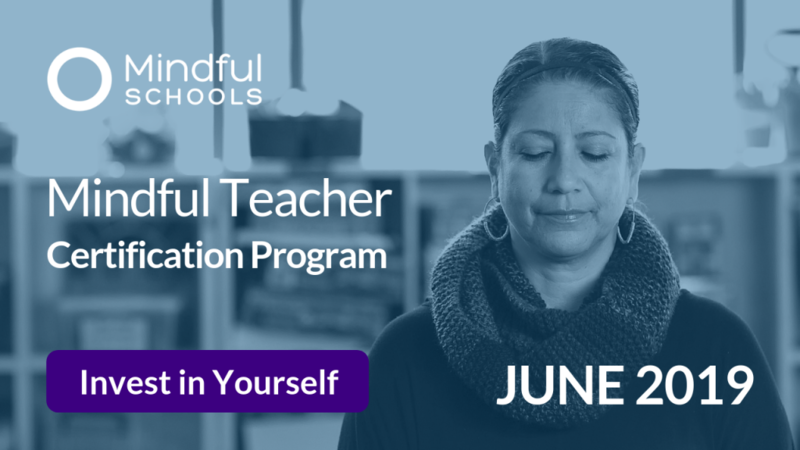 Linda Ryden is a Mindful Schools graduate and the creator of the Peace of Mind Program, a cutting-edge combination of mindfulness, conflict resolution, and social-emotional learning. 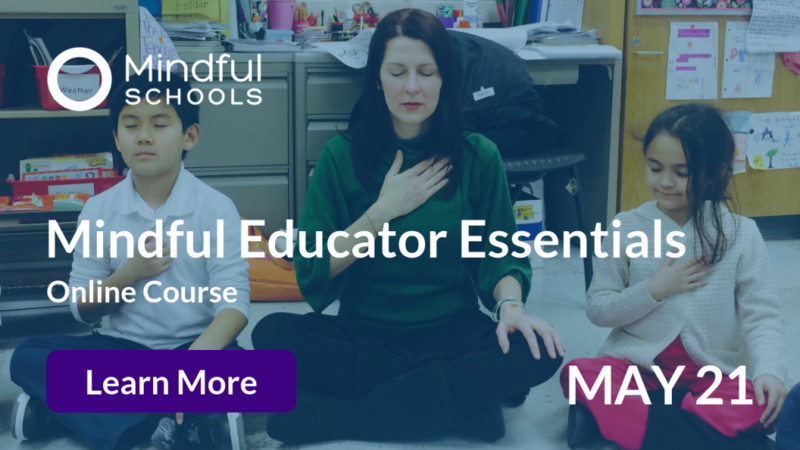 Linda is the author of the Peace of Mind Curriculum Series and is the full-time Peace Teacher at Lafayette Elementary School, a public school in Washington, DC, where she teaches Peace classes to more than 600 children every week. Linda is the author of four children’s books including Rosie’s Brain, Henry is Kind, and the forthcoming Sergio Sees the Good, and Tyaja Uses the THiNK Test. Linda brings a passion for teaching peace and over 25 years of teaching experience to her work with children and adults.